Some links below may be affiliate links which means that you do not pay anymore, however, any purchase will result in a small commission to this site. So, what types of felt can you cut? That really depends on what type of machine you have. Cricut Explore Air 2: You can cut the Cricut felt with no backing or regular felt from the craft store with heat and bond added to the back. Thicker felts will not work well with this machine. Cricut Maker: You can cut all the felt! I have cut everything from Cricut felt to regular felt to super thick wool felt all with no backing and no issues! What Cricut blade cuts felt? The blade you use is again going to depend on which machine you are using. Bonded fabric blade – I would use this for most felt thicknesses in the Cricut Explore Air 2. Fine point blade – If you are using the Cricut felt, you should be able to use this blade in your Cricut Explore Air 2. Deep cut blade – You can try this for bonded felt that is a bit thicker in your Cricut Explore Air 2. Rotary blade – If you have the Cricut Maker, I would hands down recommend this for any thickness of felt. It cuts like a dream! Cutting felt with the Cricut Explore Air 2 is a bit of a challenge in that the cuts are not always clean. But it is totally possible. Here is a rundown of the types of felt and how to cut them with your machine. 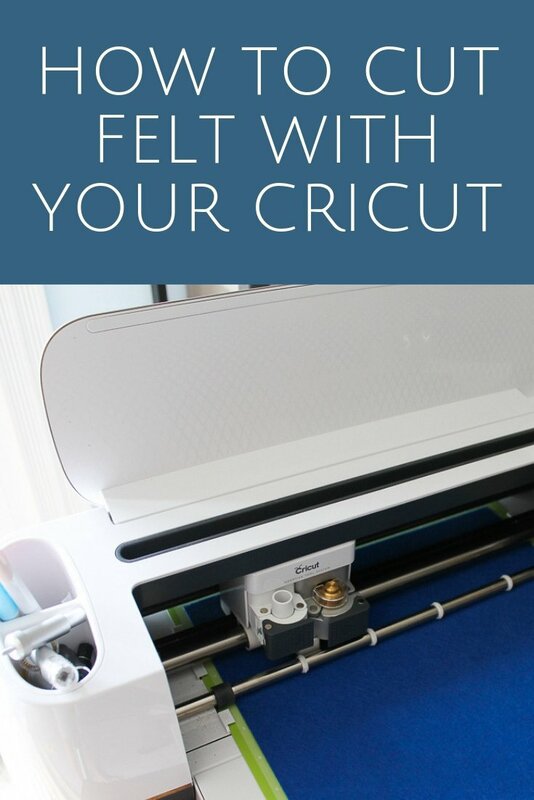 Cricut Felt – Use the fine point blade and put the felt directly on the mat. Please note that felt tends to leave quite a bit of fiber on your mat so it may need to be cleaned more quickly. Regular Felt – You will need to add some sort of backer. Try a heat n bond material. Once the backing is added, put the material on your mat and use the bonded fabric blade for cutting. Thick Felt – Again it will need a backer, but you may need your deep cut blade depending on how thick it is. The thicker felts may not cut at all on the Cricut Explore Air 2. If you are lucky enough to have a Cricut Maker, it cuts felt like a dream! How to cut felt with your Cricut Maker? It is so easy! For ANY felt, just add it to the mat and when the machine prompts you to pick a blade click “edit tools.” Pick the rotary blade instead of whatever blade it is indicating to cut felt. Then cut away! I have had the best luck with the rotary blade when cutting projects and I have done a ton of them! I would recommend using the pink fabric mat with felt and the Maker. Remember that you will ruin the mat more quickly as the fiber from the felt will shed excessively. Here are a few tips and tricks I have learned from doing a ton of projects and experiments with felt and both machines. Intricate cuts may not work no matter what you do. Some cuts are going to just be too much for the felt material. I do however get better and more intricate cuts with my Maker and the rotary blade. You may have to experiment with machine settings especially if you are cutting thicker pieces of felt. Pick what you think the material is like. For instance, you may pick denim instead of felt as you are cutting a really thick piece. Just watch the machine carefully as it is cutting and adjust if needed. To make another cut on your material just click the “C” button again before unloading your mat. This allows you to experiment with materials without ruining a ton of it. Now that you know how to cut felt with your Cricut, what can you make? Here are some sample projects to use with your machine. So, now that you know how to cut felt with Cricut, are you ready to make all the things? Cutting felt with Cricut is super easy and something that you should definitely try. You will be hooked on all of the no-sew projects no matter if you have a Cricut Explore Air 2 or a Cricut Maker. If you have any more questions about cutting felt with your Cricut, be sure to leave them in the comment section below.